School Mission: As a school community of staff, students and parents, we commit to virtues such as courtesy, excellence, respect and responsibility. Through the active promotion of these values we will instill the attitudes, knowledge and skills for lifelong learning. McGirr Elementary School enrols 445 students in kindergarten to grade 7. 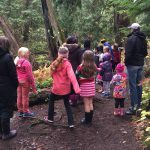 We are located in north Nanaimo with a diverse student population and engaging learning environment. This year we welcome 35 students from Rutherford as a result of that school closing on June 29 2018. There are 19 divisions and a Strong Start program at McGirr.